There are numerous Android Application Stores used all over the world by android users. But most of the people are just familiar with the name “Play Store”. There are various App Stores through which you can download paid apps for free. Let us list some of the best Android App Stores that are alternative to Play Store. Moreover, these App Stores will help you download paid apps for free. Amazon is amongst one of the best app stores used widely. No doubts, it’s one of the best alternatives that offers a wide range of games and apps for the Android phones or devices. Moreover, Amazon app store file can easily be downloaded and installed on any Android device. The app store offers outstanding deals and offers. GetJar is nothing new to Symbian device users. The app store is very prominent for it’s elegantly organized and well-categorized apps. The software is accessible through a web interface. Moreover, it also comes as an official app. You can easily download this app and it’s quite straightforward, but it is not compatible with latest Android standards. Aptoide is nowadays becoming more popular among Google Play Store users due to its ability to find free applications as compare to other application stores. It provides its users a better chance to use an app without piracy because of a clean interface between web and users. Although the paid apps are full of ads and their authenticity is questionable. This application fulfills the google standards and its experience is as good as play store. On installation, it greets with a welcome screen as a sign of app’s functionality. As this app encourages piracy but still one of the best app stores for downloading paid apps for free. You can find any app which is available on play store. It has a user-friendly interface UI and very easy to use. Moreover, it also works without login in this app store. The one property of this app store which beats all other is that is free of popups and ads. 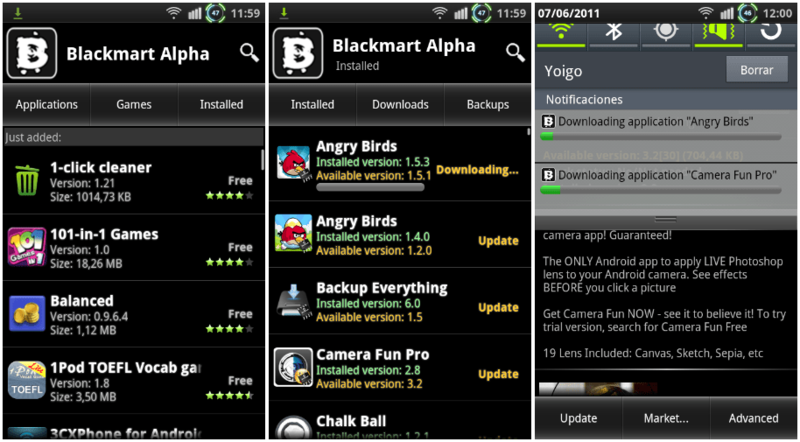 Blackmart Alpha contains over 10 million apps and games which user can download easily and install them on their androids. F-Droid is the best possible app for app developers and it can be downloaded for free from its official website. This app store is funded by donations, and the apps are Free and Open Source Software (FOSS). The apps also do not have any reviews or ratings. Moreover, it provides access to apps and also their codes for free. App developers can also copy the code from F-Droid. Previous articleThis Pakistani girl “Marvi Soomro” left her six-figure job for…………!